Warmer weather means grilling season and kabobs are always a crowd favorite. And honey mustard anything is always a favorite of mine. I love it and always need extra for dipping. 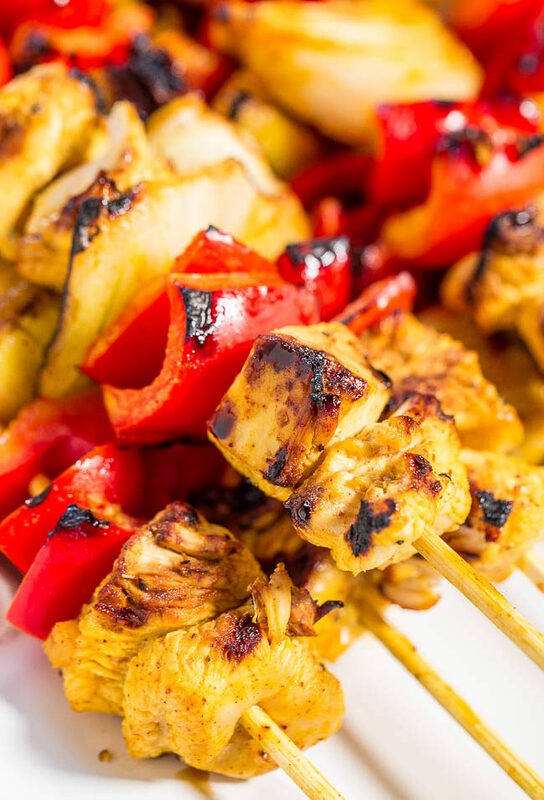 The kabobs are easy, healthy, and perfect for your next cookout, party, as a treat for dad on Father’s Day, or as a fun weeknight dinner option. The chicken marinates in a mixture of honey, yellow mustard, pineapple juice, chili powder, garlic powder, salt, and pepper. It’s made with everyday ingredients but there’s a nice balance of savory, spicy, salty, and sweet. I place bite-sized pieces of chicken into a large Ziplock, add all the marinade ingredients using the eyeball method, seal and squeeze the bag, and let it marinate in the fridge until I ready to thread the chicken onto skewers. In addition to the chicken I used red peppers and yellow onions on the kabobs because my family is fond of them, but use your favorite veggies. You can scale the recipe up or down depending on how many people you’re feeding. The chicken is juicy and moist, the vegetables are crisp-tender, and the natural flavor that comes with grilling just makes everything taste so good. My family loved the kabobs and asked when I’m making them again. 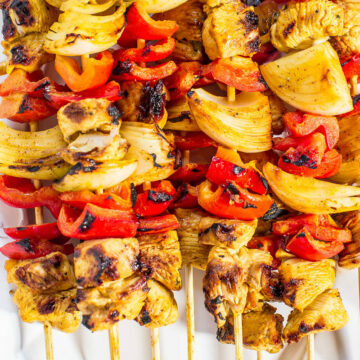 The kabobs are easy, healthy, and perfect for your next cookout, party, as a treat for dad on Father’s Day, or as a fun weeknight dinner option. The chicken marinates in a mixture of honey, yellow mustard, pineapple juice, chili powder, garlic powder, salt, and pepper. It’s made with everyday ingredients but there’s a nice balance of savory, spicy, salty, and sweet. I used red peppers and yellow onions on the kabobs, but use your favorite veggies. The chicken is juicy and moist, the vegetables are crisp-tender, and the natural flavor that comes with grilling just makes everything taste so good. Chicken – To a gallon-sized ziptop plastic bag, add the chicken, pineapple juice, yellow mustard, honey, optional olive oil, chili powder, salt, pepper, garlic powder, seal bag, and squish the chicken around gently (don’t puncture bag) but thoroughly enough to coat evenly. Place bag in the fridge for at least 30 minutes, or up to 3 hours, to marinate. Place skewers in water to soak and chop vegetables while chicken marinates. Remove chicken from fridge and thread on wooden skewers. On each skewer I typically add 2 pieces chicken, 2 to 3 pieces of red pepper, 1 stack of onion, 2 pieces chicken, 2 to 3 pieces red pepper, 1 stack onion; but use whatever ordering is desired. Continue threading the skewers until all chicken and vegetables have been used. Lightly brush leftover marinade over the vegetables so they’re coated. Place skewers onto a hot grill or grill pan and cook for about 7 minutes, or until chicken is done and cooked through, flipping every few minutes as necessary for even cooking. While waiting, make the honey mustard dip. Honey Mustard Dip – To a small bowl, add the mustard, honey, and whisk to combine. Serve kabobs with dip. Kabobs are best warm and fresh, but ingredients can be taken off skewers and placed into an airtight container and will keep for up to 4 days in the fridge. Reheat gently prior to serving if desired. 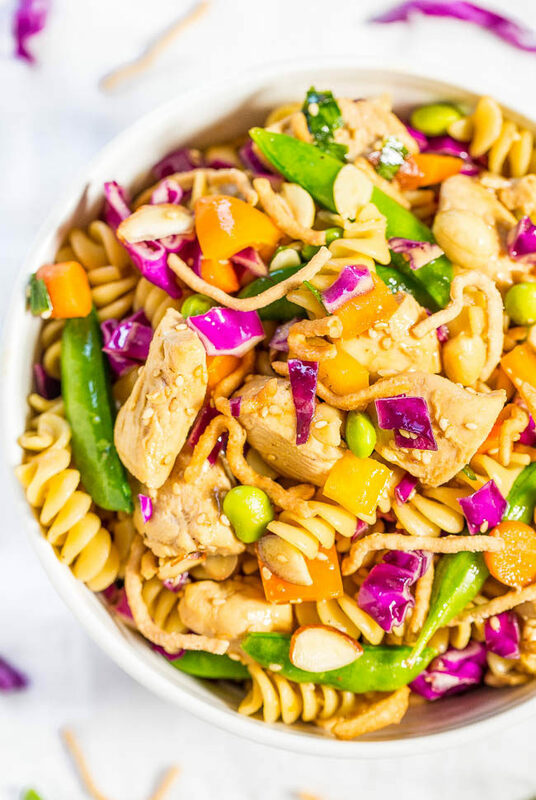 Chinese Chicken Pasta Salad – Big juicy chicken chunks and texture galore from the rainbow of crispy veggies! Fast, easy, fresh and healthy!! 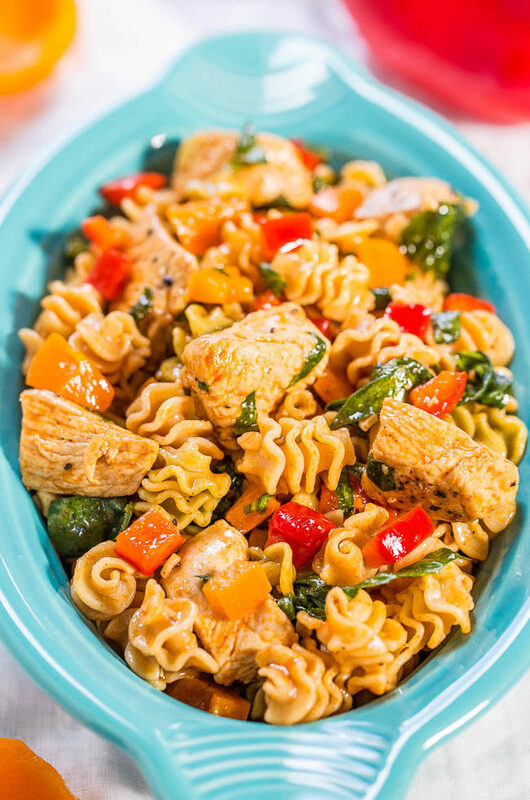 Great for picnics, potlucks, and easy dinners! I love, love the ingredients of the marinade. I´ve written them down and I´m definitely going to make it. These kabobs look amazing! 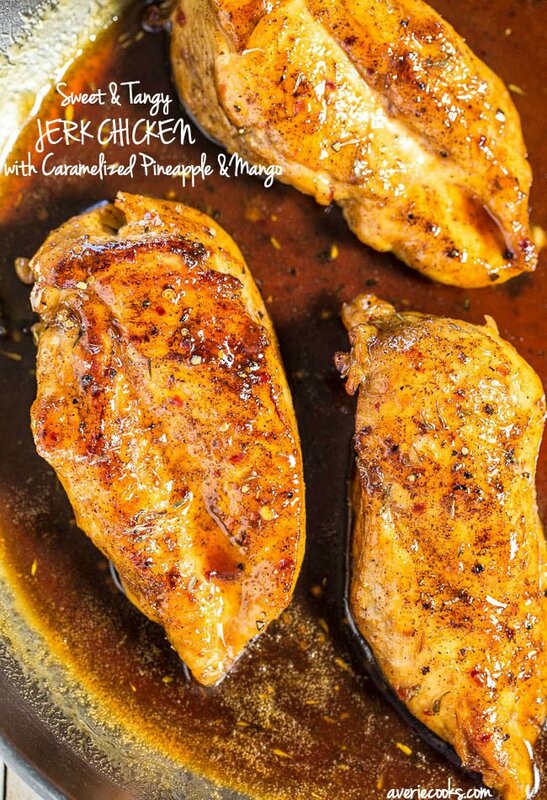 I’m a big fan of pineapple in there, because it caramelizes everything and makes the chicken that much better! Great July 4th BBQ option, Averie! I love pineapple in more savory dishes for the caramelization, too! Kebabs are fun–and I think they can count as finger food too if you don’t mind getting a little messy. This is going on my radar–honey mustard anything is delicious and leftovers would be perfect over greens the next day. Wow, Averie! These are just the thing to make during a summer night. :) I love them. If I had to pick a condiment to marry, it would be honey mustard. 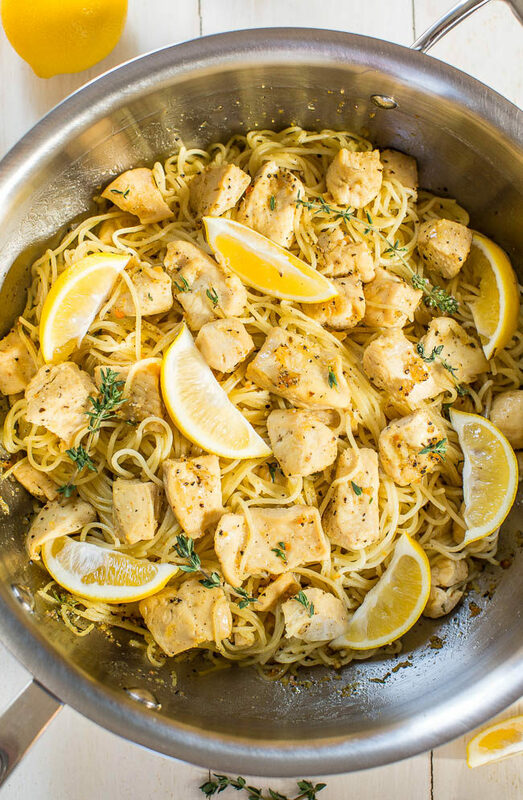 I want that creamy goodness on ALL the things…and this chicken is no exception…pinning! That would be the same one I’d marry! Thanks for pinning! “Using the eyeball method”–love it! I love honey mustard (and honey) on chicken. Yum. These are delicious recipes! I’m sure I’ll try them as soon as possible. Those kabobs look awesome. My mouth waters just looking at them. Yum. Just like you honey mustard anything and everything (well, except cake lol) is a favorite of mine. Love the simplicity of these kebabs, so perfect and flavorful for barbecue parties! I love kabobs, but I’m too lazy to make them. My grill basket is way easier. But, honey mustard sauce has just become a must-try! Food just tastes better (and looks better) on a stick. LOVE this honey mustard magic! 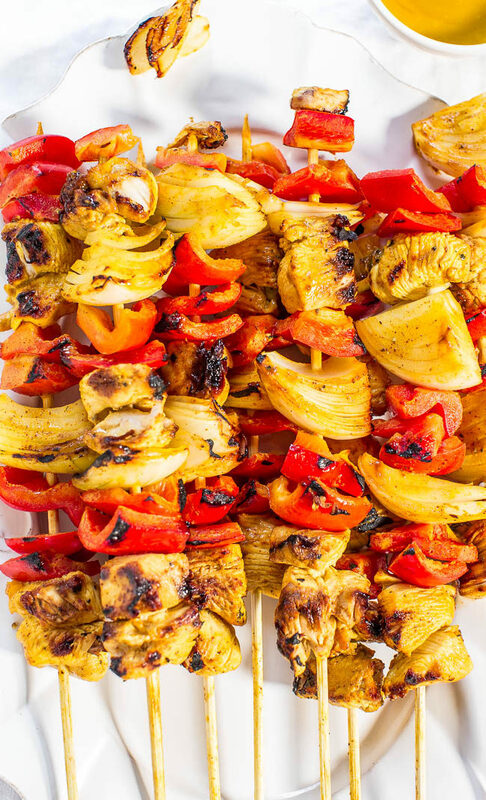 These kabobs look absolutely amazing! Definitely going to be trying them this summer! These look so good! My husband loves honey mustard. He is going to go crazy for these! 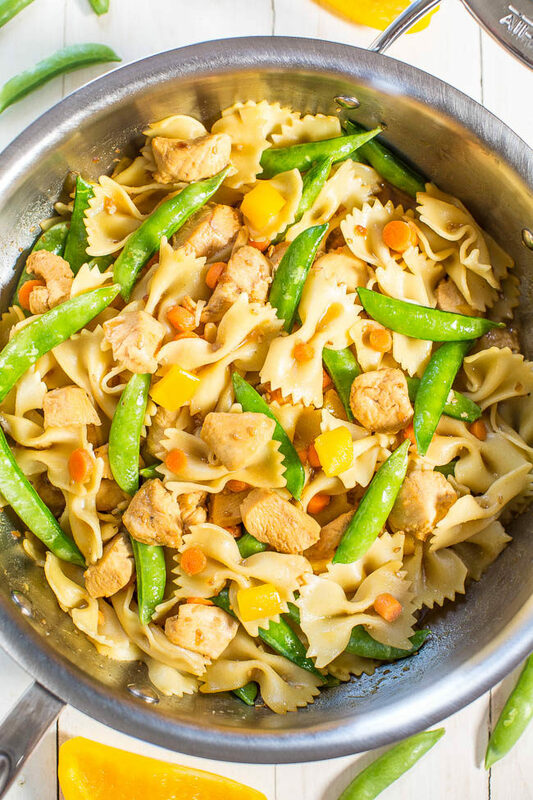 I love all of the flavors of this recipe! I know this would make for some happy guests! do you think these would work on a George Foreman grill? That’s all we have right now and these look SOOO good!! I need them! I have never used a G.F. grill so cannot say for sure but I actually made these on an indoor grill pan because I live in a condo with no backyard and that’s my only option for grilling. These look delicious. I’m going to do them for our next cookout (hopefully next Sunday).